Tropical green heart shaped amethyst gemstones will capture your attention and your heart, with these heart shape green amethyst stud earrings in silver from Apples of Gold Jewelry. 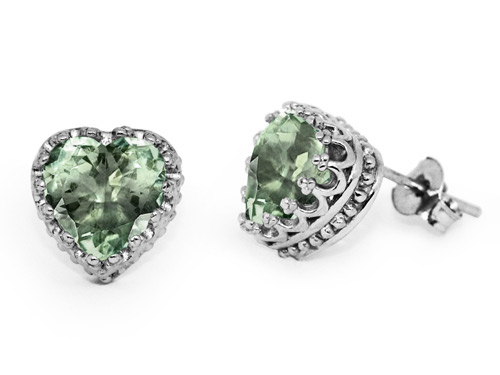 Each earring has a 10mm by 10mm heart shaped authentic green amethyst gemstone as the focal point, held in place by a .925 sterling silver stud earring. The prongs surrounding the gemstone add a little extra flair to the earring, and the sweet green color make it ideal for all seasons. Each earring measures 3/4 inch by 1/2 inch in size, and are perfect for formal occasions or every day wear. We guarantee our Heart Shape Green Amethyst Stud Earrings in Silver to be high quality, authentic jewelry, as described above.